Once an import has been completed you are able to see a detailed overview of the import results. The overview contains pieces of information, which we explain further in this guide. The statistics table will hold information about the results of your completed import. Subscribers: The amount of new e-mail addresses on the list. Updated data: The amount of new subscribers who updated one or more data fields if the Update data box was marked. Please be aware, if duplicates exists in the import file, it is the data in the last e-mail address that will be transferred to Ubivox. Subscribers: The amount of subscribers already subscribed to the list. Ubivox leaves out duplicates thus leaving one unique e-mail address on each receiver. If the e-mail address appears more the one place in the import file, then the extra amount of e-mails will be counted as if they are already subscribed. Updated data: The amount that has received an updated on one or more data fields in Ubivox. Subscribers: The amount of subscribers who was already active and already subscribed to the newsletter. Updated data: The amount of subscribers who received an update on one or more data fields in Ubivox. 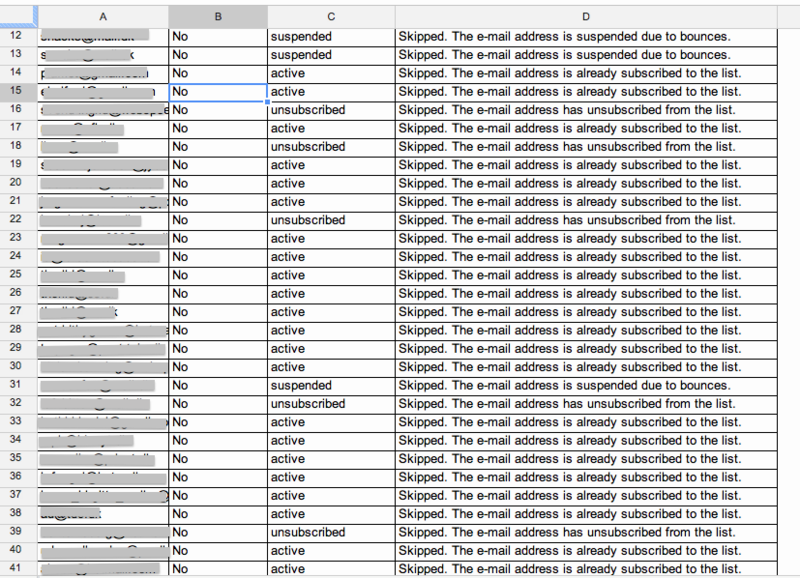 Subscribers: The amount that exist on the list but who has been suspended due to too many bounces. Subscribers: The amount that already exists on the list but who are unsubscribed at the moment. These may not be activated on the list through an import but must subscribe to the newsletter independently. Subscribers: The amount of suspended who has been reactivated. This only happens if Activate suspended has been selected at the import. Subscribers: The amount of e-mail addresses in the file, which are invalid due to one or several reasons. It might be a missing @, missing period mark etc., or that the domain is listed on the Ubivox blacklist. Subscribers: The amount of subscribers that previously complained about receiving the newsletter from the list in Ubivox. Subscribers: The total number of e-mail address rows in the import file. Updated data: The total amount of subscribers who received an update on one or more data fields in Ubivox. Furthermore you are able to go to your status file from the detail page of the finished import file. The file gives you a detailed overview of the e-mail addresses you just imported. Go to Lists and Subscribers --> Import --> Finished imports --> View details and click at Download status file. You are now downloading a CSV-file that you can open in Excel. When you open the file in Excel you will see a list that states the given e-mail(s) was/were not imported.